Please join us at 6:30 p.m. on Thursday 8th March 2018 at the Montgomery County Health and Human Services Building at 210 Pepper St., Christiansburg . The heavy winter losses sustained this year by beekeepers across our region underscore the importance of raising our own colonies. Aside from being a strategy for apiary sustainability, raising new colonies is one of the more rewarding aspects of beekeeping. While this topic has become an annual event for our association, this year Richard Reid will direct the presentation toward beginning beekeepers. His approach should enable even first year beekeepers to successfully start a nuc or full size colony with confidence. Ultimately the NRVBA hopes to break the cycle of bringing in bees from distant states and, instead, replace them with bees successfully adapted to our region. 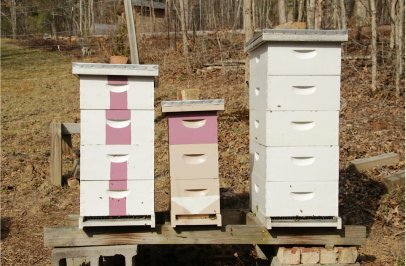 What you should be doing with your bees. Fred’s Follies:What you should have learned at last month’s meeting had you been paying attention! Main Topic: “Splits and Nucs: Expand and Sustain Your Beekeeping” by Richard Reid.